You long to put a charming smile on his face every day just as much as he does for you, right? 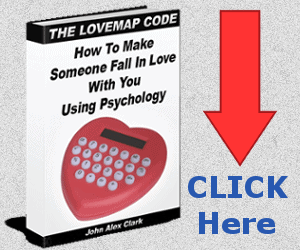 If that’s true, then you really need this beautifully written Cute Love Messages for your Boyfriend. Below are the Cutest Love Messages for Him – Boyfriend. 1. You alone I want to be with for the rest of my life. Your undivided attention and affection for me are what I crave for every day. I love you tenderly, handsome. 2. A cute love message can’t describe how your love makes me feel. You make me feel like a toddler and a princess all at once. I love you beyond words. 3. Looking forward to seeing you every time makes every day and moment with you amazing and fabulous. I love you so much, my dearest. 4. I don’t care about what the world thinks because, at the end of the day, it’s just you and I that matters. I love you to the moon and back. 5. My friend, my brother, my boyfriend, my better half and my everything, I love you beyond the stars. 6. There is no me without you because being away from you makes me feel incomplete. I love you more than you can imagine. 7. I don’t have any reason to be anxious about anything because as long as I am with you, I will be just fine. I love you so much, handsome. 8. The happiness and love within me know no boundaries and I guess this is how it feels to be loved and cared for by someone as special as you are. I love you dearly, my prince charming. 9. Your unconditional love for me is a like a bottle of whiskey, the older the better. I love you more than love itself. 10. All I need today, tomorrow and forever is your love because your love is the air I breathe. 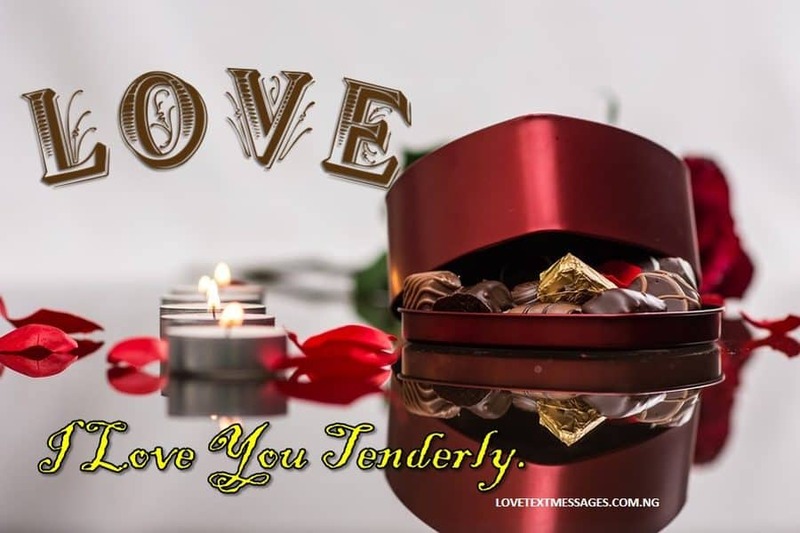 I love you tenderly. 11. Nothing I cherish so much more as this sweet bond between us. You know that I love you right? Well, I do. 12. I know I’m in love. With you, is where I found true and real love. I love you so much more than you can imagine. 13. You’re my everyday hero and my knight in shining armour, and I want you to know that I love you to the moon and back. 14. I never knew I was this special and beautiful until you came into my heart and treat me like your princess. I love you so much, my prince charming. 15. With you, I don’t think I’m in love, I know that I’m. Everything I see around me reminds me of you always. I love you tenderly. 16. In times of doubt, you give me courage and in my weaknesses, you strengthen me. I love you beyond the stars. 17. Because of you, my today is better than yesterday and I know it will be more beautiful tomorrow. I love you dearly, handsome. 18. Without you, there’s no beautiful future to hope for, because there’s no me without you. I love you beyond words. 19. Your undivided attention and affection for me change my sorrow to joy, sadness to happiness. I’m glad to have you, my dearest. I love you to the moon and back. 20. Everything you do amazes me and I want you to know that you mean the world to me. I love you beyond the stars, handsome. 21. You’ve planted your love in my heart from the moment I met and water it every day with your care. I love you tenderly, my prince charming. 22. Come rain or sunshine, I want you to know that my love for you is here to stay. I love you beyond words. 23. What more can I say, boy? I love you so much more than love itself. Always have and always will. 24. Falling in love with you wasn’t a once upon a time thing for me because each time I see you I keep falling in love with you again and again. I love you tenderly. 25. The kind of love I have for you is like a tree planted by the rivers of water, whose leaf will not wither away but also stay fresh. I love you beyond the stars. 26. Whenever I’m around you, my heart is filled with love, my day with joy and my life is full of happiness. I love you more than you can imagine. 27. You’re always close to me because my heart is where you belong and you will always remain there. I love you to the moon and back. 28. Within this cute love message, I want you to know that you’re the best thing that ever and always happens to me. I love you dearly, handsome. 29. The moment I stopped worrying about me and started reminiscing about you all day long, that’s when I knew I have found true love – with you. I love you more than love itself. 30. Day in day out, I know there’s one person out there who got my back – You. And I love you beyond words. 31. Even if my day was stressful, as long as you’re in my thought, it will always be a beautiful day for me. I love you dearly, my prince charming. 32. 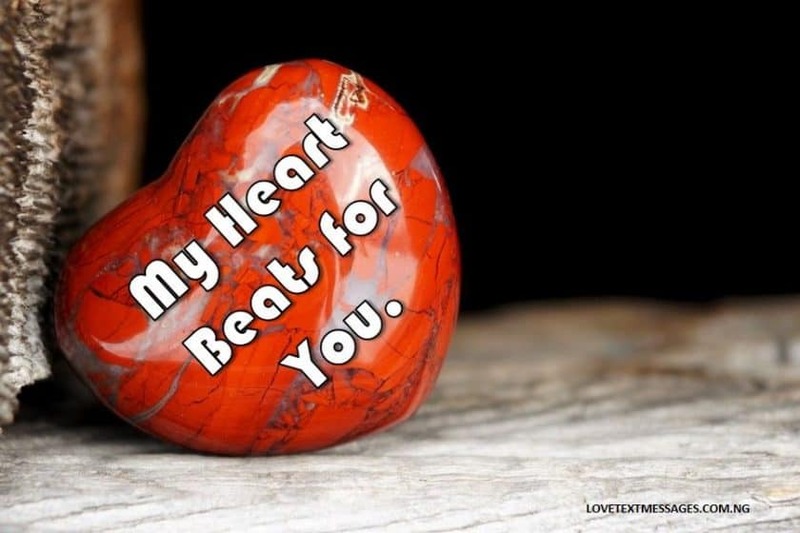 For you, my soft and tender heartbeat. For you, my mind and thoughts are all about you. Whether my eyes are closed or opened, it’s you I see always. I love you so much, my dearest. 33. You always come through for me. You’re indeed my surest person and I love you more than you know. 34. I’m your cheerleader and you’re my everyday inspiration and motivation. We both make an unbeatable duo, don’t you think? I love you tenderly. 35. Asking me to describe how I feel when you kiss and caress me is like asking me to explain a copied assignment because I just can’t explain it! I love you to the moon and back. 36. What it’s like to be cared for and loved by you is just unexplainable. You know that I love you right? Well, I do. 37. I want to spend every sixty seconds in my every minute of my every day with you. Yes, you. I love you dearly, my love. 38. There is no better day than a day in your arms. You know that I love you right? Well, I do. 39. Since you’re with me, everything looks perfect and beautiful. I’m glad to have you and I love you beyond words. 40. I soar higher each and every day with you because your love gives me the courage to fly above every challenge of life. I love you beyond the stars. 41. Thanks for all that you’ve given me, thanks for all that you’re giving me and thanks for all that you’ll ever give me. I love you more than love itself. 42. Hearing your charming voice from many miles away brighten up my day. I love you to the moon and back. 43. Your love flows in all that I do since your love is the blood pumping in my heart and the air that I breathe. I love you tenderly, handsome. 44. The bond of the love of our togetherness means I am yours till the end of time. You know that I love you right? Well, I do. 45. Dearest, let’s face the world together. Yes, you and I, because we both make an unbeatable team. I love you tenderly. 46. There’s no sadness whenever I’m with you. Everything you do or say, you do it for me and I love you beyond words. 47. For the universe, you might just be like every other dude, but for me, you mean the world to me. I love you to the moon and back. 48. The ups and downs of life can’t dare to separate the love between us. I love you more than love itself. 49. No matter where I go, you will always be with me, because you’re always in my heart, where you belong. I love you beyond the stars. 50. I’m so excited that all my daydreams are my reality now, with you beside me. I love you to the moon and back. 51. When the thought of how blessed I am to have you rob my mind, I wish I had met you long before now. You know that I love you right? Well, I do. 52. Reminiscing about you and your love for me every day is a routine I don’t get bored doing. I love you tenderly, my prince charming. 53. It’s definitely going to be one of many beautiful moments, as I will be spending the whole day with my dearest – You. I love you beyond words. 54. Thanks for always having my back and I love you more than love itself. Always have and always will. 55. No one else cares and loves me like you do and that’s why I’m going to love you like no one else had ever loved you. I love you to the moon and back, handsome. 56. The way you make me feel, no one else in the entire universe does. I love you beyond the stars. 57. I’m going to cherish and love you all my life, for this is my vow to you, my dearest. I love you more than you can imagine. 58. Beautiful thoughts never seize to pop up in my mind. You know why? Because there are all about you, handsome. I love you dearly. 59. You’re all I got on my mind and it comes with a wonderful feeling. I love you so much more than you can imagine. 60. I placed an order for a tulip, I got bouquet in return and I asked God for a man after His heart and you were given to me. I’m glad to be with you and I love you beyond words. 61. You have given me happiness and joy and love in so many ways I least expected and all o can say is, Thanks. I love you tenderly. 62. If I was to consider falling in love again in another generation, I will always choose to fall in love with you. I love you to the moon and back. 63. Among thousands of guys, you stand out and among millions of people, you’re special; always have and always will. I love you more than love itself. 64. I’m just going to take a moment and bless God for the gift of someone as caring, loving and understanding as you are in my life. I love you beyond words. 65. Your love is so real to be true and it’s also as amazing as you are, but most importantly, I’m glad you’re mine. Thanks for being real and I love you dearly. 66. I would rather be madly in love with you than be with someone else. You know that I love you right? Well, I do. 67. You’re my everyday hero, my everyday prince charming and my everyday happiness. I love you beyond the stars. 68. To my most handsome, loving and charming boy, I love you to the moon and back. 69. Just one wish I ask of the Lord, to be with you till the end of time. And if people do fall in love in Heaven, you bet, I will choose to fall for you all over again and again. I love you dearly. 70. In good or bad times, I know you will always have my back and that’s why I love you more than love itself. 71. Your charming smile calms my nerves, your love light up my darkest hour and your presence bring me peace of mind and body. I love you beyond words. 72. Come rain or sunshine, I’m forever and always yours. You know that I love you right? Well, I do. 73. You’re my top priority just as much as my happiness and joy are your greatest priorities. I love you more than you can imagine. 74. Be happy and always stay cool, because I’m not going anywhere. Not today, tomorrow or a day after tomorrow. I’m here to stay until the end of time. I love you tenderly. 75. As long as you’re mine, my heart will always be filled with gratitude and love. I love you to the moon and back. 76. With you, the unattainable things become attainable, and the impossible becomes possible. I am glad to have someone like you, and I love you dearly. 77. You’re a rare gem, and I vow to cherish and love you with all my heart, body, soul and mind. I love you to the moon and back. 78. I’m intoxicated by your unconditional love to the point where all I do or say, I do it for you. I love you beyond the stars. 79. You groom me each and every day with your care and love, and I want you to know that I’m blessed to have you. I love you dearly. 80. I couldn’t bear the thought of my life without you in it. You’re my everyday happiness and you mean more than words can describe. I love you more than you can imagine. 81. You’ve always treated me specially, like a princess and I promise to bring you happiness and joy every day. I love you beyond words. 82. The cloud nine sensation I have within me when I reminisce about you is unexplainable. I love you so much, my prince charming. 83. It can only be you. You occupied the space in the room of my heart and you watered it with your care and love just the way a gardener would do to a garden. I love you beyond words. 84. Whether you’re near or many miles away, it doesn’t matter, because you’re always on my mind and in my heart. I love you to the moon and back. 85. You want to know why I love, right? I love you without a reason. There’s no reason why… I just do. I love you so much, my prince charming. 86. From the moment I saw you, I knew I was going to spend the rest of my life, cherishing and loving you. 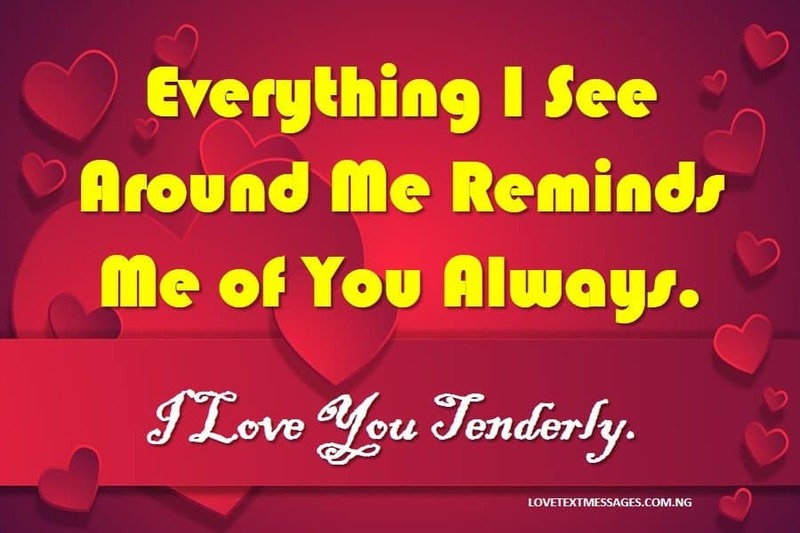 I love you tenderly. 87. You’ve always stood by me and I promise to stand by you always. I love you more than love itself. 88. I have made it a routine to always wake up in the morning and hit the bed at night with the thought of you. I love you beyond the stars. 89. Your love is the sweetness that gladdens my heart and I’m blessed to have you. I love you so much, my dearest. 90. Hello dearest, I want you to know that you will always and forever be in my heart. I love you to the moon and back. 91. If love is blind truly, I would rather be blindly in love with you than live a day without you. I love you tenderly. 92. I found joy, happiness and love when I met you. You’re truly my everyday happiness and love. I love you beyond words, handsome. 93. Chocolate is sweet, but your unconditional love for me is sweeter. You know that I love you right? Well, I do. 94. You’re charming and handsome in your way and I love you just the way you are. I cherish you forever, my dearest. 95. No matter time of the day is and no matter what the weather is, I will always cherish and love you beyond words. 96. You fill my boring life with so much joy, love and happiness, and I want you to know that I’m honoured to be with you. I love you tenderly. 97. You matter a lot to me and I vow not to do anything that will jeopardize our relationship. I love you to the moon and back. 98. I cherish every moment with you just as much as I cherish you always. You know that I love you right? Well, I do. 99. Every day with you is another avenue to cherish you more than ever before. I love you beyond words. 100. Each day, I love you more than the previous day and I will always and forever love you with every breath in me.